The release of the highly anticipated MIRROR'S EDGE is upon us. For months, the music used in teaser trailers have had people excited about the music. While originally found as the title "Shine" by the enigmatic Alcorus, the final credit is listed as the track "STILL ALIVE" by LISA MISKOVSKY. On November 11, this title theme will be available in more remixed permutations that you can shake a Duran-Duran-Moon Zappa-stick at. You can download them now from AmazonMp3. And don't forget about the game itself, which is garnering pretty high praise already. Check the full presser below...which includes a link for a FREE DOWNLOAD of one of the remixes! MAKES NORTH AMERICAN DEBUT WITH "STILL ALIVE,"
Already a household name in her homeland, Swedish rock/pop star Lisa Miskovsky makes her North American debut with "Still Alive," the title track to EA's highly anticipated title Mirror's Edge, which hits store shelves on November 11) for the PLAYSTATION3 computer entertainment system and the Xbox 360 videogame and entertainment system versions. In conjunction with the launch of the game, DICE, an EA studio, is digitally releasing a remix album for Mirror's Edge which features the original version of "Still Alive" and remixes by some of today's most in-demand artists including Paul van Dyk, Junkie XL, Teddybears, Benny Benassi and Armand Van Helden. In its various incarnations, Miskovsky's song defines the Mirror's Edge remix album. A landmark digital release designed to continue the convergence of music and gaming, the project presented Miskovsky - who has earned international acclaim on the strength of two chart-topping studio albums - an opportunity for her memorable and ethereal pop/rock anthem to be enthusiastically remixed by the world's top electronic performers and producers. Be it Teddybears' exuberant, clap-driven rendering, Junkie XL's lilting danc-pop renovation, Paul Van Dyk's pulsing ten-minute trance-floor workout, Benny Benassi's frenzied version or Armand Van Helden's slice and dice interpretation or the song in its original, beautiful state, "Still Alive" sounds destined to live in the hearts and minds of pop fans, club denizens and consumed gamers alike for years to come. "I wrote the melody for the vocals and the lyrics, inspired by the story and the characters in the game, "Lisa explains of the uplifting number she co-wrote with Rami Yacoub and Arnthor Birgisson (Pink, Britney Spears, Kelis). "I had never had my music remixed by any of them before and it is always interesting to hear what they will come up with." With a mantle full of honors at home for her #1 eponymous debut and its platinum-selling #1 follow-up, Fallwater, Miskovsky--who was the recipient of several Rock Bears (Sweden's Grammy equivalent) including "Best New Artist", "Best Female Artist" and "Artist of the Year" and even co-wrote along with Max Martin and Rami Yacoub the Backstreet Boys hit "Shape Of My Heart"--is certainly deserving of the chance. Since her 2001 debut, Lisa has racked up an impressive string of hits in her homeland, including "Driving One of Your Cars," "Lady Stardust," "Sing To Me", Â“MaryÂ” (from her 2006 studio disc, Changes) and Â“Another Shape of My HeartÂ” (from 2008's Last Years' Songs: Greatest Hits). She's also collaborated with Sweden's alt-country hero Christian Kjellvander and dueted with Dennis Lyxen (frontman for the (International) Noise Conspiracy) on his Lost Patrol project. Clearly a multi-instrumentalist, Miskovsky has embraced diversity in her music, even lending her vocals to "Dead End," the 2006 track by Swedish death metal group In Flames. And if that isn't enough, Lisa is an avid sportswoman, who was once a member of the Swedish National Snowboarding team. 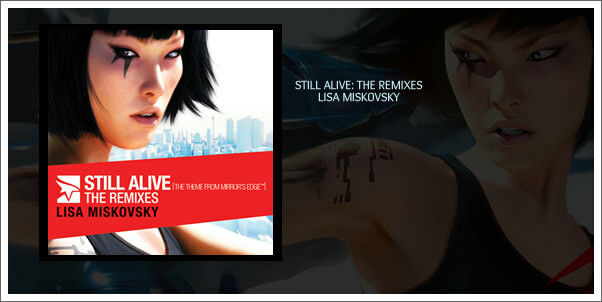 In addition to the release of the album, Mirror's Edge has teamed with Jamglue.com for the Mirror's Edge Theme Song "Still Alive" Remix Contest. From November 11 through April 11, contestants may enter the contest by creating their own version of "Still Alive" by adding new sounds, rearranging the clips, etc. using the Jamglue Mixer. "Still Alive" remixers will be in the running for the grand prize--an Xbox 360 and a $200 EA gift certificate for EA's online store. Winners will be announced by June 1, 2009. Jamglue.com--which was created in 2006 with the idea of making it easy for musicians to collaborate over the internet--is an online community that allows members to create and personalize audio. Musicians can upload and record music, remix it online and then share. Contestants can remix "Still Alive" by visiting: Mirrorsedgemusic.com/remix.